And now I shall show you what hasn’t been seen by human eyes for more than one hundred and thirty years. She’s the same woman I saw in my dream. Stop talking for a minute, I’m trying to think something out. Then the fact that so very little has been written about them would indicate that something unusual happened to them. The portrait is secure, and so am I. You know, there’s always a little mysterious, and, well, something a little frightening about, well, the moon, going totally dark when the earth’s shadow crosses over it. What are we going to tell them, that they’re going to die, and they’re going to come back as some sort of mysterious ghost? Some of them look like I wrote them, some look like you. Where is the room? The portrait of Abner Collins didn’t find it for us. Just tell about the ones that tell about the playroom, please. Elizabeth’s had her chart drawn up by an astrologist? 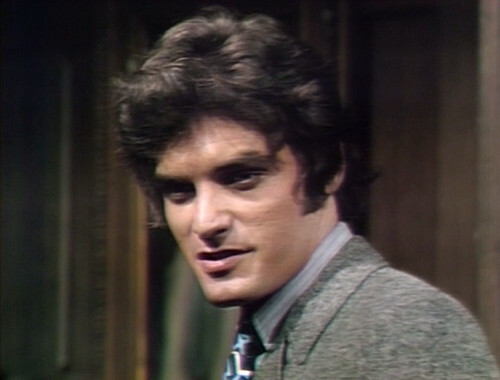 It states that Collinwood is to come under a siege of unrelieved tranquility. I’ve got to tell her that there’s danger for the entire house! Whatever happens isn’t necessarily going to happen to the children, it could happen to anyone! “When the music ends, the play begins.” I wish it would make more sense! Monday: Say Yes to the Dress. When Barnabas looks out the drawing room window at the moon, you can get a glimpse of one of the studio lights. 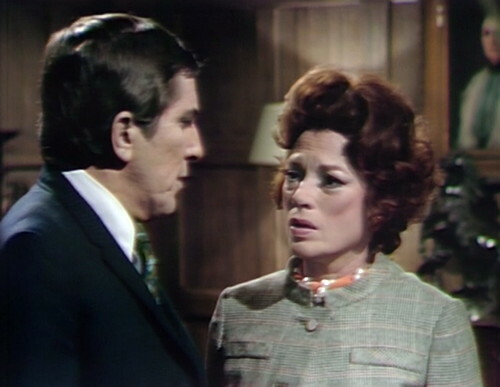 After Julia leaves David’s room, someone in the studio coughs. Dark Shadows Wiki points out that the final picture used for the lunar eclipse is actually from a solar eclipse. Lunar eclipses don’t have a “ring”. 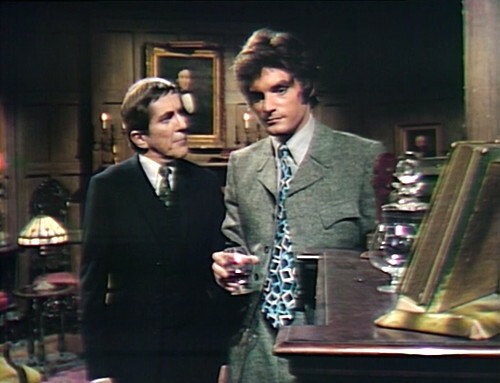 Don Briscoe (who played werewolf Chris Jennings) was fired from Dark Shadows back in April, while Barnabas was in Parallel Time. His behavior had become erratic, based on some combination of drug use and mental health problems. 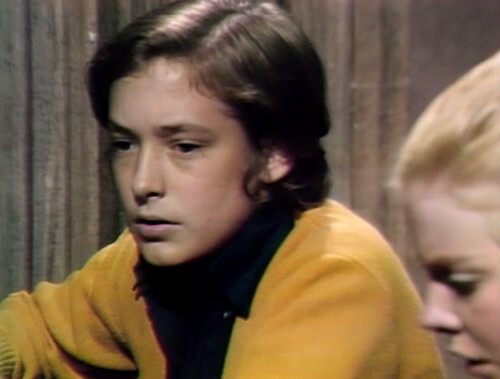 Now that they’ve returned to the present-day storyline, Chris is gone, taking his sister Amy (Denise Nickerson) and girlfriend Sabrina (Lisa Richards) with him. Richards last appeared in June, and Nickerson’s last episode was in July. Alex Stevens, the stunt man who played Chris as the werewolf, growled for the last time back in March. 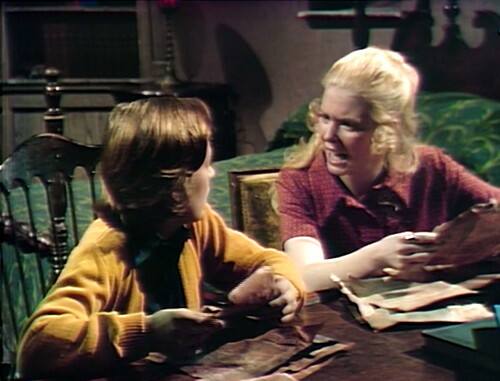 This episode is the only time the characters are mentioned after Parallel Time; Quentin looks at the full moon, and says, “I hated to see him and Sabrina and Amy go away together, like they did. 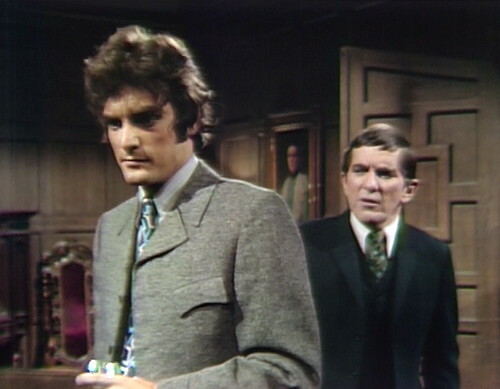 I can’t help thinking about what may be happening to them, especially on a night like this.” The werewolf storyline, which ran on and off from November 1968 to March 1970, is never resolved on the show. 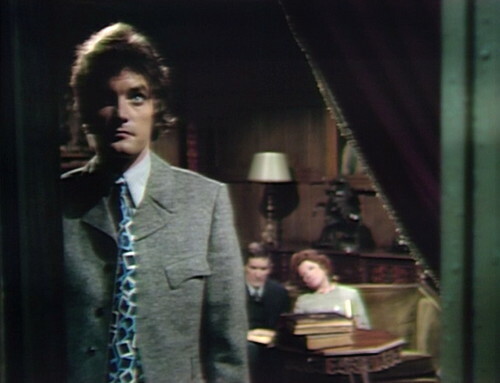 Big Finish has continued the story in their line of Dark Shadows audio plays. In 2013’s The Enemy Within, Sabrina reveals the tragic way that her marriage to Chris ended, and she continues to battle against the werewolf curse in 2014’s Carriage of the Damned. Amy returns in 2013’s The Lucifer Gambit, and she plays an important role in several following audiobooks, leading up to one of the major story threads in the 2015 Bloodlust miniseries. If you want to follow this story, Dark Shadows Every Day readers can get a 25% discount on Big Finish’s Dark Shadows audiobooks range, by using the code DSED25OFF when you check out. This offer is valid until Dec 31, 2017. Hallie looks like Tonya Harding. “Hallie looks like Tonya Harding.” Ha! if Henesy had waited until this storyline to have his accident, then we could have had a crazed Tonya Hallie be the one to break his legs, instead of Jeb. How do we know that it wasn’t Henesy who hit Cody’s arm with the studio door? Here is where David starts wearing a nerdy cardigan sweater for episodes upon episodes and Hallie starts wearing mod Brady Bunch dresses. The lack of chemistry is palpable and the clothing clash just exemplifies this. They are as mismatched on camera as Quentin and Beth were. Just painful. To be fair, nothing’s going to look like a spark between David and anybody for a long time after seeing him and Amy together. I know they were just kids, but to my eyes they had a chemistry that was like lightning in a bottle. Those early days in 1969 when they were first exploring the west wing were so exciting! They are rather annoying. Hallie is too mellow dramatic and David just grates my nerves. David’s been possessed by Mr. Rogers! 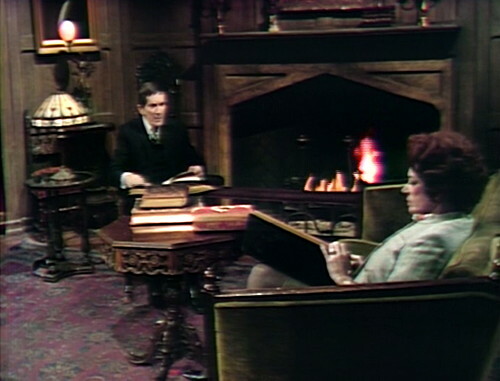 In the fourth picture, it looks like Julia’s trying to eeever so casually lean over and sneak her head onto Barnabas’s unsuspecting shoulder. Quentin, I MUST HAVE THAT TIE. I must have that Quentin. Quentin drives me crazy in this part of the show. I’m sorry, but you simply do not get to have a magic portrait that makes you immortal and keeps your lycanthropy in check, have a time-traveling vampire for your best friend, and be a cynic! He sounds ridiculous. You know, that would explain a LOT about Spellcheck. Spell Check must have had an after school job in 1969. He sure does sound ridiculous! 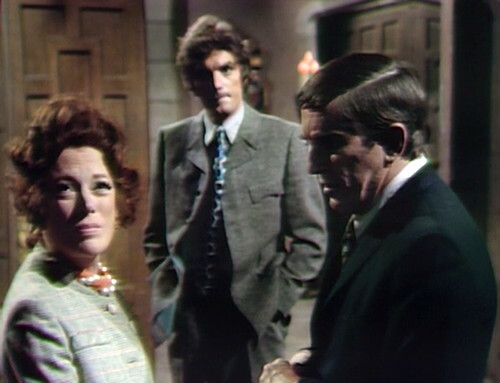 Why in the world would he doubt what Barnabas and Julia are telling him after all they have been through? And he just eggs it on by falling for the ghost of Daphne. I swear, this man needs a job – as in employment. Any leads on Abner Collins, by the way? I think Abner and Oscar were ‘confirmed bachelors’, and because of their libertine lifestyles, were considered the ‘black sheep’ and not mentioned in family histories. Abner could have been Flora’s late husband. Abner and his wife Gladys lived across the street from Angelique. Gladys was replaced by a different Gladys and eventually went mad. And that’s when Abner moved to Dogpatch and took up with Daisy Mae Scragg. 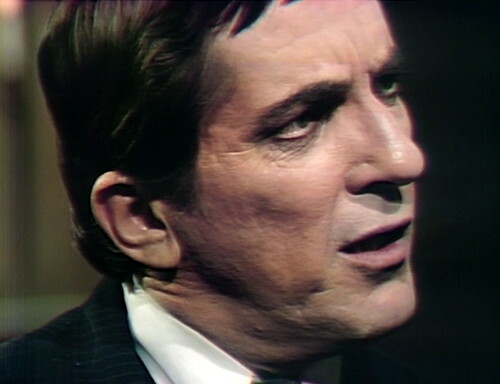 Dark Shadows really needs Roger Collins at this point. Big time! Hallie looks like she just said “Marcia! 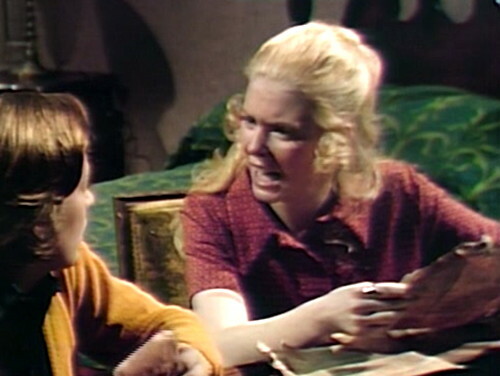 Marcia! MARCIA!”. 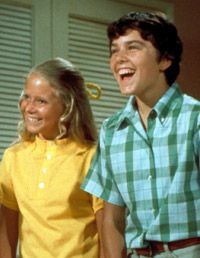 I was trying to think of who Hallie looks like and she does look like Jan Brady! Hallie only name-checks David nine times in twenty-two minutes, for an average of once every two minutes and twenty-seven seconds. We may forget what his name is, at that rate!